Most reports suggest that today’s blasts in Mumbai occurred around 7.10 pm. 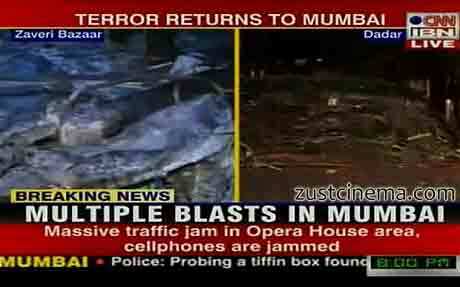 Simultaneous blasts rocked Zaveri Bazaar, Opera House and Dadar. Zaveri Bazaar houses Jewellery shops and is right next to Mumbadevi temple - the place from where Mumbai draws its name. All metros have been placed on high alert. Airports have been closed and reports suggest that panic, inevitable that it is, is not as widespread or chaotic. Those injured have been rushed to JJ and KEM hospital, though there are conflicting reports on the number affected/killed. A BSF plane has left for Mumbai with NSG personnel. Current Home Minister P Chidambaram is chairing a high level meeting. It’s confirmed that improvised devices were used for the blasts. Unprecedented help is being offered on Twitter as phone lines are jammed. Here’s a blog that is collating all helplines and offers of help. 10:27 pm: 'I was at my shop when I heard a deafening sound. I ran out to see what has happened. I saw a building rattling and people running here and there', said a eyewitness at one of the blast site. 10:22 pm: The blasts that rocked Mumbai were a 'coordinated attack by terrorists', Home Minister Chidambaram said. 'The blasts took place between 6.45 p.m. and 7 p.m. and therefore we infer from this that this was a coordinated attack by terrorists,' the home minister said. 10:15 pm: Ministry of home affairs have confirmed that 20 have been killed and 113 injured in the blast. 10:10 pm: Following are some major militant attacks on India in recent years. 9:55 pm: President Patil wished speedy recovery for those injured in the blasts. 9:30 pm: Manmohan Singh had a telephonic conversation with Maharashtra Chief Minister Prithviraj Chavan following the three blasts that rocked Mumbai. Manmohan Singh has asked Chavan to keep him posted about the various developments taking place after the blasts. 9:23 pm: Advisory: the Mumbai Taxi Workers Union has confirmed that all cabs will go off the roads at midnight. 9:13 pm: Maharashtra CM says that police have confirmed that 17 have been killed and 81 injured in the blasts. 9:10 pm: Pakistan President Asif Ali Zardari and Prime Minister Yusuf Raza Gilani have in official reactions condemned the blasts in Mumbai, expressed their sympathy for and solidarity with the Indian leadership and people, and condoled the victims. 9:07 pm: Home Ministry officials say that India had no advance intelligence indicating the possibility of such attacks. 8:45 pm: A vehicle with registration number MH-43 A 9384 was found damaged at the Dadar blast site. The police are enquiring about its details. 8:42 pm: Maharashtra Chief Minister Prithviraj Chauhan has confirmed 13 dead in the blasts, and over 100 injured to various degrees of severity. 8:40 pm: Even as a BSF plane with NIA officials, forensics experts and anti-terrorist personnel are en route to Mumbai, Home Minister P Chidambaram has taken the chair at an emergency Cabinet meeting. 8:22 pm: Home secretary RK Singh says 2 killed and 100 people have been injured in the blast. 7:32 pm: 7:30 pm - Early reports indicate casualties in Zaveri Bazaar blast. 7:30 pm: Fire under control in Zaveri Bazaar, says eye witness. 7:25 pm: Eyewitnesses report hearing explosion sound near Kabuthar Khaana in Dadar. It is located next to Dadar Station. 7:15 pm: Three blasts reported from different parts of Mumbai - Dadar, Prasad Chambers in Opera House and Zaveri Bazaar.